The total estimated expenditure for Phase III expansion is Rs.41,079Cr. JICA is going to provide 48.57 per cent of the total fund requirement while the Government of India and the Government of Delhi will pay 10.04 per cent each. CC24 project, awarded to J Kumar Infraprojects Ltd. in Joint Venture with China Railway Tunnel Group Company Ltd. (CRTG), China, is a part of Phase III Line 7, also known as Shopping Corridor, from Mukundpur to Yamuna Vihar. Delhi Metro Rail Corporation is the client and General Consultants are providing consultation for the project. Total contract cost for this project is Rs.1011Cr and the completion period of the project is 42 months. CC24 is fully underground having tunnel length 6966m and tunnel diameter of 5.8m. Underground stations, each of about 26m length – 4 nos. at Lajpat Nagar, Vinobapuri, Ashram and Hazrat Nizamuddin, to be constructed by cut & cover method (top-down & bottom-up methods). 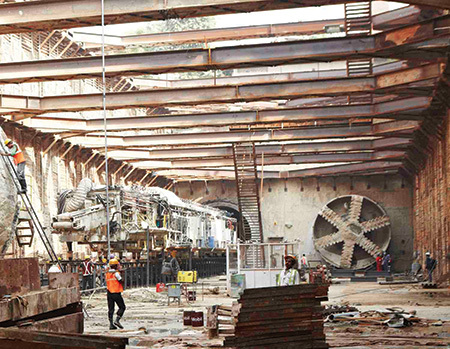 Terratec (Australia) Tunnel Boring Machine (TBM) has been used for tunnelling purpose. Length of each of the twin (upline & downline) bored tunnels with 5.8m finished internal diameter, to be constructed by shield TBM method – 3.33km (approx). There will be 16 cross passages between bored tunnels. For stations, the scope of work includes all architectural, civil, finishing, plumbing & drainage works, diversion of all charted & uncharted utilities and traffic management. existing elevated Metro station at Lajpat Nagar. At Vinobapuri, an external launching shaft has been constructed to facilitate launching and driving of the TBMs between Vinobapuri and Ashram station so that Vinobapuri station works can be carried out parallel without any impact on the completion of the key dates of Vinobapuri station. Non-availability of land for almost 40% portion of the station at Ashram due to which the length of the station has been reduced from 265m to about 150m. Severe space and logistics constraints due to shifting of the major portion of the station, after reduction in its length, to the very busy and congested traffic intersection at Ashram with very heavy traffic flow, and also the station is sandwiched between an existing flyover on one side and buildings/shops etc. on the other side. Ashram station presents one of the most difficult stations to be constructed so far in the history of DMRC projects. Hard rock and very high water table (almost at ground level) encountered at Hazrat Nizamuddin station and cut & cover tunnel areas. Also, the rock strata and profiles are varying steeply, requiring changes in the design and methods of construction. 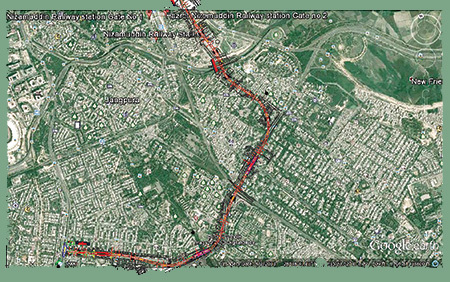 Construction of cut & cover tunnel across Ring Road with very heavy traffic flow in both directions at Sarai Kale Khan is required to be done by diversion of Ring Road traffic in 2 stages. This project is expected to be completed and handed over to DMRC by December 2017. It will serve the commuters on Mukundpur to Yamuna Vihar corridor. Delhi Metro is expecting a daily average ridership of four million after completion of Phase III.